Chicken or fish? While this might be the question posed to you by a stewardess on the transatlantic flight to your Parisian honeymoon, it is also one of the preliminary gourmand details that will need to be ironed out before the day of your Maine wedding. Of course, it does not need to be chicken or fish. It can be succulent lobster tails or tender medallions of filet mignon. It can be an informal, backyard fish fry or a classic New England clambake on the beach (a place that is equally ideal for wedding photos). In other words, it is your special day, and the world is your Pemaquid oyster. However, there is no way that you are slicing, dicing, chopping, sautéing or preheating anything, so it is time to let the professional take over. Bon Appetit. Decisions, decisions, decisions: Planning and executing a dream wedding is all about making choices. Where you decide to host your wedding reception will determine what type of catering service you use. From intimate settings and exclusive seaside retreats to country clubs and country estates, there are numerous wedding venues in Maine that provide their own catering. At the same time, catering companies can transform an off-premise location into a 5-star dining experience. The classic New England clambake can be an elegant and refined affair or a simple re-creation of a traditional (and laid-back) Maine lobster shack. It is a general rule of thumb to book a catering company three months prior to your wedding. Most catering companies are like movable parties. They will provide tents, awnings, chairs and every other modern accouterment that you deem necessary for your once-in-a-lifetime gala. Remember: The food is the most important aspect of the reception. It is the part of the wedding that every guest is going to remember. Sure, the music is vital too, but in the end every DJ is going to dig into the dusty archives for 1980s nostalgia numbers and Conga-line wedding hits. YMCA is mandatory. If the food you serve is memorable, then your entire wedding reception will stand out. When you are looking for that special Maine caterer, take your time and explore a variety of options. You need to sample dishes. You need to taste test. This is the one chance you have to live the life of a food critic. Choosing the right caterering company is just like choosing a favorite restaurant for all your closest family and friends. So, Honey, What’s For Dinner? Chicken or fish? In Maine, that age-old question is not so simple. While many couples opt for fire-engine red lobster, flaky white haddock and other traditional coastal delicacies, the lakes region of Maine is home to landlocked salmon and brown trout. In northern Maine, it is not uncommon to find a wedding dinner with freshly plated wild game. Foie gras, anyone? You bet. While the decadent champagne and whisky fountains may have waned in popularity in recent years, what is your feeling on an oyster fountain? A gargantuan display of fresh Maine oysters is sure to make a lasting impression on your guests. Maine is known for its community farms, back-to-the-land lifestyle and organic produce, so a locally sourced catering company is also an option. While sampling and taste testing is an integral part of the wedding process, every bride and groom should have a cheat-sheet that points them in the right direction. Seriously, with all the giddy nerves and butterflies in the stomach, who can think about food? From the budget-minded and luxurious to the intimate gathering and large-scale spectacle, here is a look at some of Maine’s best-known catering services. The Black Tie Company is based in Portland. It has been catering and planning events in Maine for over twenty-five years. It specializes in lobster bakes. Catering By Evalin, which is also in Portland, uses only local ingredients. Call Me Ishmael Catering can also be found in Portland. Belle Fete Events and Catering provides flawless food and exquisite attention to detail. It is stationed in Brunswick. 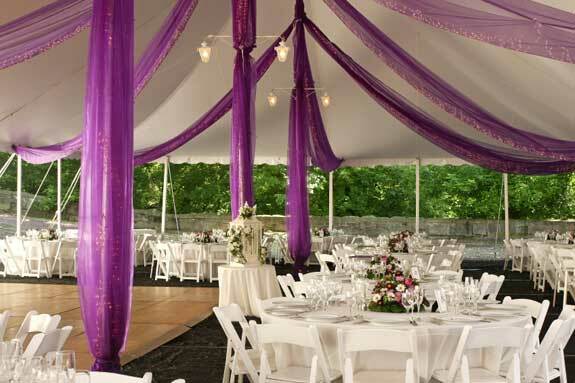 Blue Elephant Events and Catering is well known for its creativity and innovation. It is located in Saco. Are you in the mood for some BBQ or a catered clambake? Captain Hog Tie BBQ, in Newcastle, is your place. Divine Cuisine Catering, West Enfield.